Mercantilism is a national economic policy that is designed to maximize the exports of a nation. 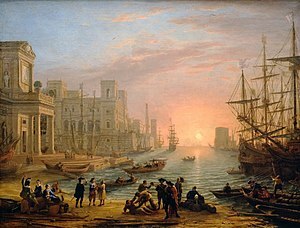 Mercantilism was dominant in modernized parts of Europe from the 16th to the 18th centuries before falling into decline, although some commentators argue that it is still practiced in the economies of industrializing countries in the form of economic interventionism. It promotes government regulation of a nation's economy for the purpose of augmenting state power at the expense of rival national powers. Mercantilism includes a national economic policy aimed at accumulating monetary reserves through a positive balance of trade, especially of finished goods. Historically, such policies frequently led to war and also motivated colonial expansion. Mercantilist theory varies in sophistication from one writer to another and has evolved over time. High tariffs, especially on manufactured goods, was an almost universal feature of mercantilist policy. These policies aim to reduce a possible current account deficit or reach a current account surplus. With the efforts of supranational organizations such as the World Trade Organization to reduce tariffs globally, non-tariff barriers to trade have assumed a greater importance in neomercantilism. Mercantilism became the dominant school of economic thought in Europe throughout the late Renaissance and the early-modern period (from the 15th to the 18th centuries). Evidence of mercantilistic practices appeared in early-modern Venice, Genoa, and Pisa regarding control of the Mediterranean trade in bullion. However, the empiricism of the Renaissance, which first began to quantify large-scale trade accurately, marked mercantilism's birth as a codified school of economic theories. Mercantilism in its simplest form is bullionism, yet mercantilist writers emphasize the circulation of money and reject hoarding. Their emphasis on monetary metals accords with current ideas regarding the money supply, such as the stimulative effect of a growing money-supply. Fiat money and floating exchange rates have since rendered specie concerns irrelevant. In time, industrial policy supplanted the heavy emphasis on money, accompanied by a shift in focus from the capacity to carry on wars to promoting general prosperity. Mature neomercantilist theory recommends selective high tariffs for "infant" industries or the promotion of the mutual growth of countries through national industrial specialization. England began the first large-scale and integrative approach to mercantilism during the Elizabethan Era (1558–1603). An early statement on national balance of trade appeared in Discourse of the Common Weal of this Realm of England, 1549: "We must always take heed that we buy no more from strangers than we sell them, for so should we impoverish ourselves and enrich them." The period featured various but often disjointed efforts by the court of Queen Elizabeth (reigned 1558-1603) to develop a naval and merchant fleet capable of challenging the Spanish stranglehold on trade and of expanding the growth of bullion at home. Queen Elizabeth promoted the Trade and Navigation Acts in Parliament and issued orders to her navy for the protection and promotion of English shipping. A systematic and coherent explanation of balance of trade emerged in Thomas Mun's argument England's Treasure by Forraign Trade or the Balance of our Forraign Trade is The Rule of Our Treasure - written in the 1620s and published in 1664. In Europe, academic belief in mercantilism began to fade in the late-18th century, especially in Britain, in light of the arguments of Adam Smith (1723-1790) and of the classical economists. The British Parliament's repeal of the Corn Laws under Robert Peel in 1846 symbolized the emergence of free trade as an alternative system. Most of the European economists who wrote between 1500 and 1750 are today generally considered mercantilists; this term was initially used solely by critics, such as Mirabeau and Smith, but was quickly adopted by historians. Originally the standard English term was "mercantile system". The word "mercantilism" was introduced into English from German in the early 19th century. The bulk of what is commonly called "mercantilist literature" appeared in the 1620s in Great Britain. Smith saw the English merchant Thomas Mun (1571–1641) as a major creator of the mercantile system, especially in his posthumously published Treasure by Foreign Trade (1664), which Smith considered the archetype or manifesto of the movement. Perhaps the last major mercantilist work was James Steuart's Principles of Political Economy, published in 1767. Mercantilist literature also extended beyond England. Italy and France produced noted writers of mercantilist themes, including Italy's Giovanni Botero (1544–1617) and Antonio Serra (1580–?) and, in France, Jean Bodin and Colbert. Themes also existed in writers from the German historical school from List, as well as followers of the American system and British free-trade imperialism, thus stretching the system into the 19th century. However, many British writers, including Mun and Misselden, were merchants, while many of the writers from other countries were public officials. Beyond mercantilism as a way of understanding the wealth and power of nations, Mun and Misselden are noted for their viewpoints on a wide range of economic matters. That every little bit of a country's soil be utilized for agriculture, mining or manufacturing. That all raw materials found in a country be used in domestic manufacture, since finished goods have a higher value than raw materials. That a large, working population be encouraged. That all exports of gold and silver be prohibited and all domestic money be kept in circulation. That all imports of foreign goods be discouraged as much as possible. That where certain imports are indispensable they be obtained at first hand, in exchange for other domestic goods instead of gold and silver. That as much as possible, imports be confined to raw materials that can be finished [in the home country]. That opportunities be constantly sought for selling a country's surplus manufactures to foreigners, so far as necessary, for gold and silver. That no importation be allowed if such goods are sufficiently and suitably supplied at home. Other than Von Hornick, there were no mercantilist writers presenting an overarching scheme for the ideal economy, as Adam Smith would later do for classical economics. Rather, each mercantilist writer tended to focus on a single area of the economy. Only later did non-mercantilist scholars integrate these "diverse" ideas into what they called mercantilism. Some scholars thus reject the idea of mercantilism completely, arguing that it gives "a false unity to disparate events". Smith saw the mercantile system as an enormous conspiracy by manufacturers and merchants against consumers, a view that has led some authors, especially Robert E. Ekelund and Robert D. Tollison, to call mercantilism "a rent-seeking society". To a certain extent, mercantilist doctrine itself made a general theory of economics impossible. Mercantilists viewed the economic system as a zero-sum game, in which any gain by one party required a loss by another. Thus, any system of policies that benefited one group would by definition harm the other, and there was no possibility of economics being used to maximize the commonwealth, or common good. Mercantilists' writings were also generally created to rationalize particular practices rather than as investigations into the best policies. Mercantilist domestic policy was more fragmented than its trade policy. While Adam Smith portrayed mercantilism as supportive of strict controls over the economy, many mercantilists disagreed. The early modern era was one of letters patent and government-imposed monopolies; some mercantilists supported these, but others acknowledged the corruption and inefficiency of such systems. Many mercantilists also realized that the inevitable results of quotas and price ceilings were black markets. One notion that mercantilists widely agreed upon was the need for economic oppression of the working population; laborers and farmers were to live at the "margins of subsistence". The goal was to maximize production, with no concern for consumption. Extra money, free time, and education for the lower classes were seen to inevitably lead to vice and laziness, and would result in harm to the economy. The mercantilists saw a large population as a form of wealth that made possible the development of bigger markets and armies. Opposite to mercantilism was the doctrine of physiocracy, which predicted that mankind would outgrow its resources. The idea of mercantilism was to protect the markets as well as maintain agriculture and those who were dependent upon it. Mercantilist ideas were the dominant economic ideology of all of Europe in the early modern period, and most states embraced it to a certain degree. Mercantilism was centred on England and France, and it was in these states that mercantilist policies were most often enacted. High tariffs, especially on manufactured goods. Forbidding colonies to trade with other nations. Monopolizing markets with staple ports. Banning the export of gold and silver, even for payments. Forbidding trade to be carried in foreign ships, as per, for example, the Navigation Acts. Promoting manufacturing and industry through research or direct subsidies. Maximizing the use of domestic resources. Restricting domestic consumption through non-tariff barriers to trade. Mercantilism arose in France in the early 16th century soon after the monarchy had become the dominant force in French politics. In 1539, an important decree banned the import of woolen goods from Spain and some parts of Flanders. The next year, a number of restrictions were imposed on the export of bullion. Over the rest of the 16th century, further protectionist measures were introduced. 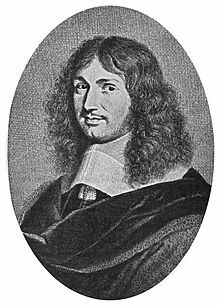 The height of French mercantilism is closely associated with Jean-Baptiste Colbert, finance minister for 22 years in the 17th century, to the extent that French mercantilism is sometimes called Colbertism. Under Colbert, the French government became deeply involved in the economy in order to increase exports. Protectionist policies were enacted that limited imports and favored exports. Industries were organized into guilds and monopolies, and production was regulated by the state through a series of more than one thousand directives outlining how different products should be produced. To encourage industry, foreign artisans and craftsmen were imported. Colbert also worked to decrease internal barriers to trade, reducing internal tariffs and building an extensive network of roads and canals. Colbert's policies were quite successful, and France's industrial output and the economy grew considerably during this period, as France became the dominant European power. He was less successful in turning France into a major trading power, and Britain and the Netherlands remained supreme in this field. France imposed its mercantilist philosophy on its colonies in North America, especially New France. It sought to derive the maximum material benefit from the colony, for the homeland, with a minimum of imperial investment in the colony itself. The ideology was embodied in New France through the establishment under Royal Charter of a number of corporate trading monopolies including La Compagnie des Marchands, which operated from 1613 to 1621, and the Compagnie de Montmorency, from that date until 1627. It was in turn replaced by La Compagnie des Cent-Associés, created in 1627 by King Louis XIII, and the Communauté des habitants in 1643. These were the first corporations to operate in what is now Canada. In England, mercantilism reached its peak during the Long Parliament government (1640–60). Mercantilist policies were also embraced throughout much of the Tudor and Stuart periods, with Robert Walpole being another major proponent. In Britain, government control over the domestic economy was far less extensive than on the Continent, limited by common law and the steadily increasing power of Parliament. Government-controlled monopolies were common, especially before the English Civil War, but were often controversial. With respect to its colonies, British mercantilism meant that the government and the merchants became partners with the goal of increasing political power and private wealth, to the exclusion of other empires. The government protected its merchants—and kept others out—through trade barriers, regulations, and subsidies to domestic industries in order to maximize exports from and minimize imports to the realm. The government had to fight smuggling, which became a favorite American technique in the 18th century to circumvent the restrictions on trading with the French, Spanish, or Dutch. The goal of mercantilism was to run trade surpluses so that gold and silver would pour into London. The government took its share through duties and taxes, with the remainder going to merchants in Britain. The government spent much of its revenue on a superb Royal Navy, which not only protected the British colonies but threatened the colonies of the other empires, and sometimes seized them. Thus the British Navy captured New Amsterdam (New York) in 1664. The colonies were captive markets for British industry, and the goal was to enrich the mother country. British mercantilist writers were themselves divided on whether domestic controls were necessary. British mercantilism thus mainly took the form of efforts to control trade. A wide array of regulations were put in place to encourage exports and discourage imports. Tariffs were placed on imports and bounties given for exports, and the export of some raw materials was banned completely. The Navigation Acts expelled foreign merchants from England's domestic trade. The nation aggressively sought colonies and once under British control, regulations were imposed that allowed the colony to only produce raw materials and to only trade with Britain. This led to friction with the inhabitants of these colonies, and mercantilist policies (such as forbidding trade with other empires and controls over smuggling) were a major irritant leading to the American Revolution. Mercantilism taught that trade was a zero-sum game, with one country's gain equivalent to a loss sustained by the trading partner. Overall, however, mercantilist policies had a positive impact on Britain helping turn it into the world's dominant trader and the global hegemon. One domestic policy that had a lasting impact was the conversion of "wastelands" to agricultural use. Mercantilists believed that to maximize a nation's power, all land and resources had to be used to their highest and best use, and this era thus saw projects like the draining of The Fens. 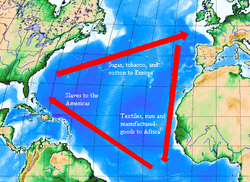 Mercantilism helped create trade patterns such as the triangular trade in the North Atlantic, in which raw materials were imported to the metropolis and then processed and redistributed to other colonies. The other nations of Europe also embraced mercantilism to varying degrees. The Netherlands, which had become the financial centre of Europe by being its most efficient trader, had little interest in seeing trade restricted and adopted few mercantilist policies. Mercantilism became prominent in Central Europe and Scandinavia after the Thirty Years' War (1618–48), with Christina of Sweden, Jacob Kettler of Courland, and Christian IV of Denmark being notable proponents. The Habsburg Holy Roman Emperors had long been interested in mercantilist policies, but the vast and decentralized nature of their empire made implementing such notions difficult. Some constituent states of the empire did embrace Mercantilism, most notably Prussia, which under Frederick the Great had perhaps the most rigidly controlled economy in Europe. During the economic collapse of the 17th century, Spain had little coherent economic policy, but French mercantilist policies were imported by Philip V with some success. Russia under Peter I (Peter the Great) attempted to pursue mercantilism, but had little success because of Russia's lack of a large merchant class or an industrial base. Mercantilism was the economic version of warfare using economics as a tool for warfare by other means backed up by the state apparatus and was well suited to an era of military warfare. Since the level of world trade was viewed as fixed, it followed that the only way to increase a nation's trade was to take it from another. A number of wars, most notably the Anglo-Dutch Wars and the Franco-Dutch Wars, can be linked directly to mercantilist theories. Most wars had other causes but they reinforced mercantilism by clearly defining the enemy, and justified damage to the enemy's economy. Mercantilism fueled the imperialism of this era, as many nations expended significant effort to conquer new colonies that would be sources of gold (as in Mexico) or sugar (as in the West Indies), as well as becoming exclusive markets. European power spread around the globe, often under the aegis of companies with government-guaranteed monopolies in certain defined geographical regions, such as the Dutch East India Company or the British Hudson's Bay Company (operating in present-day Canada). Mercantilism as a weapon has continued to be used by nations through the 21st century by way of modern tariffs as it puts smaller economies in a position to conform to the larger economies goals or risk economic ruin due to an imbalance in trade. Trade wars are often dependent on such tariffs and restrictions hurting the opposing economy. The term "mercantile system" was used by its foremost critic, Adam Smith, but Mirabeau (1715–1789) had used "mercantilism" earlier. Mercantilism functioned as the economic counterpart of the older version of political power: divine right of kings and absolute monarchy. Scholars debate over why mercantilism dominated economic ideology for 250 years. One group, represented by Jacob Viner, sees mercantilism as simply a straightforward, common-sense system whose logical fallacies remained opaque to people at the time, as they simply lacked the required analytical tools. The second school, supported by scholars such as Robert B. Ekelund, portrays mercantilism not as a mistake, but rather as the best possible system for those who developed it. This school argues that rent-seeking merchants and governments developed and enforced mercantilist policies. Merchants benefited greatly from the enforced monopolies, bans on foreign competition, and poverty of the workers. Governments benefited from the high tariffs and payments from the merchants. Whereas later economic ideas were often developed by academics and philosophers, almost all mercantilist writers were merchants or government officials. Monetarism offers a third explanation for mercantilism. European trade exported bullion to pay for goods from Asia, thus reducing the money supply and putting downward pressure on prices and economic activity. The evidence for this hypothesis is the lack of inflation in the British economy until the Revolutionary and Napoleonic Wars, when paper money came into vogue. A fourth explanation lies in the increasing professionalisation and technification of the wars of the era, which turned the maintenance of adequate reserve funds (in the prospect of war) into a more and more expensive and eventually competitive business. Mercantilism developed at a time of transition for the European economy. Isolated feudal estates were being replaced by centralized nation-states as the focus of power. 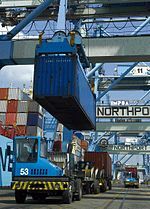 Technological changes in shipping and the growth of urban centers led to a rapid increase in international trade. Mercantilism focused on how this trade could best aid the states. Another important change was the introduction of double-entry bookkeeping and modern accounting. This accounting made extremely clear the inflow and outflow of trade, contributing to the close scrutiny given to the balance of trade. Of course, the impact of the discovery of America cannot be ignored. New markets and new mines propelled foreign trade to previously inconceivable volumes, resulting in "the great upward movement in prices" and an increase in "the volume of merchant activity itself". Prior to mercantilism, the most important economic work done in Europe was by the medieval scholastic theorists. The goal of these thinkers was to find an economic system compatible with Christian doctrines of piety and justice. They focused mainly on microeconomics and on local exchanges between individuals. Mercantilism was closely aligned with the other theories and ideas that began to replace the medieval worldview. This period saw the adoption of the very Machiavellian realpolitik and the primacy of the raison d'état in international relations. The mercantilist idea of all trade as a zero-sum game, in which each side was trying to best the other in a ruthless competition, was integrated into the works of Thomas Hobbes. This dark view of human nature also fit well with the Puritan view of the world, and some of the most stridently mercantilist legislation, such as the Navigation Ordinance of 1651, was enacted by the government of Oliver Cromwell. Jean-Baptiste Colbert's work in 17th-century France came to exemplify classical mercantilism. In the English-speaking world, its ideas were criticized by Adam Smith with the publication of The Wealth of Nations in 1776 and later by David Ricardo with his explanation of comparative advantage. Mercantilism was rejected by Britain and France by the mid-19th century. The British Empire embraced free trade and used its power as the financial center of the world to promote the same. The Guyanese historian Walter Rodney describes mercantilism as the period of the worldwide development of European commerce, which began in the 15th century with the voyages of Portuguese and Spanish explorers to Africa, Asia, and the New World. Adam Smith and David Hume were the founding fathers of anti-mercantilist thought. A number of scholars found important flaws with mercantilism long before Smith developed an ideology that could fully replace it. Critics like Hume, Dudley North and John Locke undermined much of mercantilism and it steadily lost favor during the 18th century. In 1690, Locke argued that prices vary in proportion to the quantity of money. Locke's Second Treatise also points towards the heart of the anti-mercantilist critique: that the wealth of the world is not fixed, but is created by human labor (represented embryonically by Locke's labor theory of value). Mercantilists failed to understand the notions of absolute advantage and comparative advantage (although this idea was only fully fleshed out in 1817 by David Ricardo) and the benefits of trade. For instance, imagine that Portugal was a more efficient producer of wine than England, yet in England, cloth could be produced more efficiently than it could in Portugal. Thus if Portugal specialized in wine and England in cloth, both states would end up better off if they traded. This is an example of the reciprocal benefits of trade (whether due to comparative or absolute advantage). In modern economic theory, trade is not a zero-sum game of cutthroat competition, because both sides can benefit from it. Much of Adam Smith's The Wealth of Nations is an attack on mercantilism. Hume famously noted the impossibility of the mercantilists' goal of a constant positive balance of trade. As bullion flowed into one country, the supply would increase, and the value of bullion in that state would steadily decline relative to other goods. Conversely, in the state exporting bullion, its value would slowly rise. Eventually, it would no longer be cost-effective to export goods from the high-price country to the low-price country, and the balance of trade would reverse. Mercantilists fundamentally misunderstood this, long arguing that an increase in the money supply simply meant that everyone gets richer. The importance placed on bullion was also a central target, even if many mercantilists had themselves begun to de-emphasize the importance of gold and silver. Adam Smith noted that at the core of the mercantile system was the "popular folly of confusing wealth with money", that bullion was just the same as any other commodity, and that there was no reason to give it special treatment. More recently, scholars have discounted the accuracy of this critique. They believe Mun and Misselden were not making this mistake in the 1620s, and point to their followers Josiah Child and Charles Davenant, who in 1699 wrote, "Gold and Silver are indeed the Measures of Trade, but that the Spring and Original of it, in all nations is the Natural or Artificial Product of the Country; that is to say, what this Land or what this Labour and Industry Produces." The critique that mercantilism was a form of rent seeking has also seen criticism, as scholars such Jacob Viner in the 1930s pointed out that merchant mercantilists such as Mun understood that they would not gain by higher prices for English wares abroad. The first school to completely reject mercantilism was the physiocrats, who developed their theories in France. Their theories also had several important problems, and the replacement of mercantilism did not come until Adam Smith published The Wealth of Nations in 1776. This book outlines the basics of what is today known as classical economics. Smith spent a considerable portion of the book rebutting the arguments of the mercantilists, though often these are simplified or exaggerated versions of mercantilist thought. Scholars are also divided over the cause of mercantilism's end. Those who believe the theory was simply an error hold that its replacement was inevitable as soon as Smith's more accurate ideas were unveiled. Those who feel that mercantilism amounted to rent-seeking hold that it ended only when major power shifts occurred. In Britain, mercantilism faded as the Parliament gained the monarch's power to grant monopolies. While the wealthy capitalists who controlled the House of Commons benefited from these monopolies, Parliament found it difficult to implement them because of the high cost of group decision making. Mercantilist regulations were steadily removed over the course of the 18th century in Britain, and during the 19th century, the British government fully embraced free trade and Smith's laissez-faire economics. On the continent, the process was somewhat different. In France, economic control remained in the hands of the royal family, and mercantilism continued until the French Revolution. In Germany, mercantilism remained an important ideology in the 19th and early 20th centuries, when the historical school of economics was paramount. Adam Smith rejected the mercantilist focus on production, arguing that consumption was paramount to production. He added that mercantilism was popular among merchants because it was what is now called rent seeking. However, John Maynard Keynes argued that encouraging production was just as important as encouraging consumption, and he favored the "new mercantilism". Keynes also noted that in the early modern period the focus on the bullion supplies was reasonable. In an era before paper money, an increase in bullion was one of the few ways to increase the money supply. Keynes said mercantilist policies generally improved both domestic and foreign investment—domestic because the policies lowered the domestic rate of interest, and investment by foreigners by tending to create a favorable balance of trade. Keynes and other economists of the 20th century also realized that the balance of payments is an important concern. Keynes also supported government intervention in the economy as necessity, as did mercantilism. As of 2010[update], the word "mercantilism" remains a pejorative term, often used to attack various forms of protectionism. The similarities between Keynesianism (and its successor ideas) and mercantilism have sometimes led critics to call them neo-mercantilism. Paul Samuelson, writing within a Keynesian framework, wrote of mercantilism, "With employment less than full and Net National Product suboptimal, all the debunked mercantilist arguments turn out to be valid." Some other systems that copy several mercantilist policies, such as Japan's economic system, are also sometimes called neo-mercantilist. In an essay appearing in the 14 May 2007 issue of Newsweek, business columnist Robert J. Samuelson wrote that China was pursuing an essentially neo-mercantilist trade policy that threatened to undermine the post–World War II international economic structure. In specific instances, protectionist mercantilist policies also had an important and positive impact on the state that enacted them. Adam Smith, for instance, praised the Navigation Acts, as they greatly expanded the British merchant fleet and played a central role in turning Britain into the world's naval and economic superpower from the 18th century onward. Some economists thus feel that protecting infant industries, while causing short-term harm, can be beneficial in the long term. Neomercantilism is a 20th-century economic policy that uses the ideas and methods of neoclassical economics. The new mercantilism has different goals and focuses on more rapid economic growth based on advanced technology. It promotes such policies as substitution state taxation, subsidies, expenditures, and general regulatory powers for tariffs and quotas, and protection through the formation of supranational trading blocs. ^ a b Samuelson 2007. ^ kanopiadmin (2017-02-15). "Mercantilism: A Lesson for Our Times? | Murray N. Rothbard". Mises Institute. Retrieved 2018-09-11. ^ Johnson et al. History of the domestic and foreign commerce of the United States p. 37. ^ Now attributed to Sir Thomas Smith; quoted in Braudel (1979), p. 204. ^ Jerome Blum et al. The European World: A history (1970) p 279. ^ Humphrey, Thomas M. "Insights From Doctrinal History. MERCANTILISTS. CLASSICALS" (PDF). Richmond Federal Reserve. Retrieved 14 June 2018. [...] the mercantilism of John Law and Sir James Steuart gave way to the classicism of David Hume and David Ricardo [...]. ^ a b c Magnusson 2003, p. 46. ^ Magnusson 2003, p. 47. ^ Magnusson 2003, p. 50. ^ Ekelund & Hébert 1997, pp. 40–41. ^ Landreth & Colander 2002, p. 44. ^ Ekelund & Tollison 1981, p. 154. ^ Ekelund & Tollison 1981, p. 9. ^ Landreth & Colander 2002, p. 48. ^ Landes 1997, p. 31. ^ Ekelund & Hébert 1975, p. 46. ^ Kellenbenz 1976, p. 29. ^ a b Williams 1999, pp. 177–83. ^ Hansen 2001, p. 65. ^ Hill 1980, p. 32. ^ Nester 2000, p. 54. ^ Max Savelle, Seeds of Liberty: The Genesis of the American Mind (1948) pp. 204ff. ^ Wilson 1963, p. 15. ^ Rothbard, Murray (2010). "Mercantilism in Spain". Mises Institute. ^ Spiegel 1991, pp. 93–118. ^ Emory Richard Johnson; et al. (1915). History of domestic and foreign commerce of the United States. Carnegie Institution of Washington. pp. 35–37. ^ Gauci, Perry (2011). Regulating the British Economy, 1660-1850. Farnham: Ashgate Pub. p. 83. ISBN 9780754697626. ^ Ekelund & Hébert 1975, p. 61. ^ a b Niehans 1990, p. 19. ^ Landreth & Colander 2002, p. 43. ^ Wilson 1963, p. 10. ^ Galbraith 1987, pp. 33–34. ^ Landreth & Colander 2002, p. 53. ^ Spiegel 1991, ch. 8. ^ Ekelund & Hébert 1975, p. 43. ^ Referenced to Davenant, 1771 , p. 171, in Magnusson 2003, p. 53. ^ Magnusson 2003, p. 54. ^ Ekelund & Tollison 1981. ^ Wilson 1963, p. 6. ^ Brezis 2003, vol. 2, p. 484. ^ Harris 1950, p. 321. ^ Wilson 1963, p. 3. ^ Walters & Blake 1976. ^ Rothbard 1997, p. 43. ^ Hansen 2001, p. 64. ^ Johnson 1974, pp. 1–17. Smith, George H. (2008). "Mercantilism". In Hamowy, Ronald (ed.). The Encyclopedia of Libertarianism. Thousand Oaks, CA: SAGE; Cato Institute. pp. 326–28. doi:10.4135/9781412965811.n198. ISBN 978-1412965804. LCCN 2008009151. OCLC 750831024. Wikisource has the text of the 1911 Encyclopædia Britannica article Mercantile System. 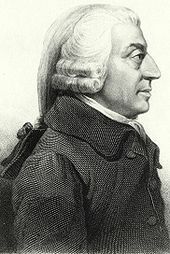 An Inquiry Into the Nature and Causes of the Wealth of Nations at Project Gutenberg: Adam Smith's "The Wealth of Nations"